Home > News > News > Six MORE 2011 Concerts Announced! Six MORE 2011 Concerts Announced! The excitement continues … we’ve just added six more amazing 2011 concerts we know you’ll love! 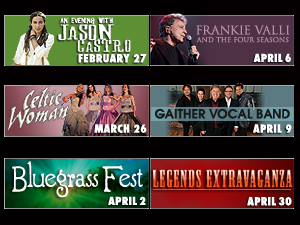 * An Evening with Jason Castro – Sunday, February 27 at 7:00 p.m.
* Celtic Woman – Saturday, March 26 at 3:00 & 8:00 p.m.
* Bluegrass Fest – Saturday, April 2 at 2:00 & 7:00 p.m.
* Frankie Valli & The Four Seasons – Wednesday, April 6 at 8:00 p.m.
* Gaither Vocal Band – Saturday, April 9 at 3:00 & 7:30 p.m.; Sunday, April 10 at 3:00 p.m.
* Legends Extravaganza – Saturday, April 30 at 2:00 & 7:00 p.m.
Be a part of the excitement at AMT in 2011! Remember – AMT Members can purchase tickets before the general public! Click here to learn more about Membership.